Poling over Curraghgower Falls at low tide, the event was the Marathon Boat Race Around St. Mary's Parish. 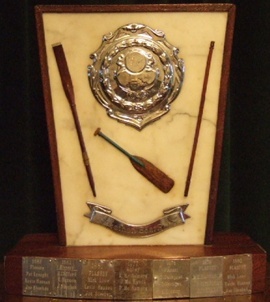 It was won by the Corbally Crew in 1951. The crew were Seanie Gilligan, Larry Kinsella and William Lysaght. Hundreds of spectators gathered at the Thomond Weir on Tuesday for the start of the Marathon boat Race round the Parish. The event was organised by the Corbally boating club. Four boats lined up for the start and, at the word "go" from Mr. Matthew O'Brien of Athlunkard Boat Club the boats picked up great speed. There was a great "set to" then as all were anxious to reach the Abbey River in the lead, Mick Hayes and crew set a rapid pace and, at Newfound, had four or five lengths to spare. The spectators, most of them on bicycles, and the rest running, gave vocal support all along the Island Bank, excitement ran high nearing Athlunkard Boat Club as the other crews were challenging and trying to make up the leeway. There was a traffic jam on O'Dwyer Bridge, the road being blocked by spectators. Going down the Sandmall, the pacemakers held on to their lead, and, approaching the rough water and rapids, the contestants could be seen changing positions in preparation for the assault on Curraghgower falls. First crew to attempt to conquer the Fall waw Hayes, Gallagher and Kiely and they were soon joined by Sheehan, Kinsella and Lysaght and both crews took possession of the narrow Passage at Geary's side. A stalemate developed here as neither crew would give way to the other. In the meantime, the other crews were sizing up the situation and Duhig's crew elected to try the centre of the Falls, an impossible task, they very soon swamped. It was very plain at this stage that all the competitors were very tired after rowing 3 miles and many thought that the Falls would remain unconquered. By now the excitement on the shore was terrific each side egging on their respective crews. 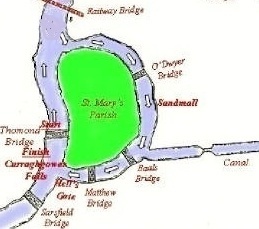 The Corbally crew, Sheehan, Lysaght and Kinsella cut across to the Strand side where they were soon joined by the other Corbally crew of Hogan, Shannessy and Cowhey. A rare tussle developed here, boats swamping, men being thrown headlong into the water, poles breaking. Again, positions were changed and, finally, after several unsuccessful attempts Nay Lysaght's crew got over to the cheers of the crowd. The winning crew were just crossing the line at Thomond Bridge when the second Corbally crew succeeded in getting over the falls. Result: 1, B. Kinsella, D. Sheehan, W. Lysaght. ; 2, M. Hogan, D. O'Shaughnessy, D. Cowhey. 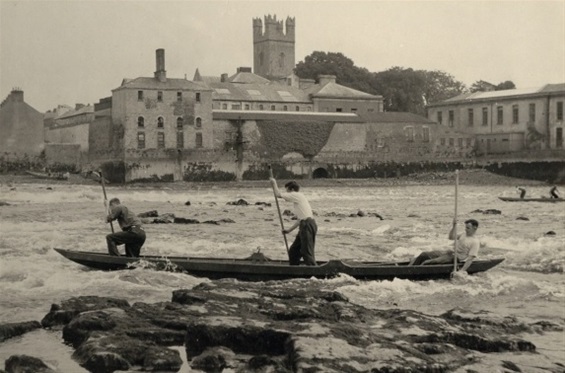 Corbally Crew 1951 - Seanie Gilligan, Larry Kinsella, William Lysaght. Crew in overturned boat: Mattie Hayes, ? ? 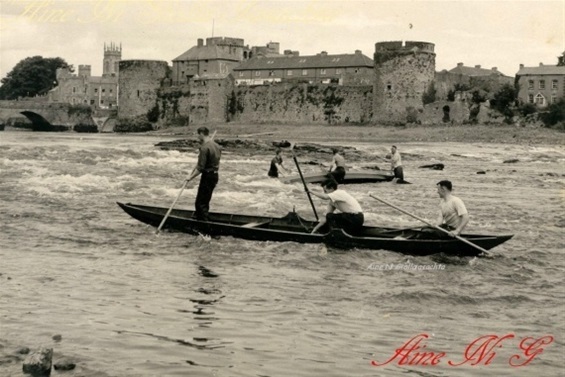 MARATHON BOAT RACE - This event proved a very popular venture, and promises to become one of the highlights in Limerick's sporting calendar. 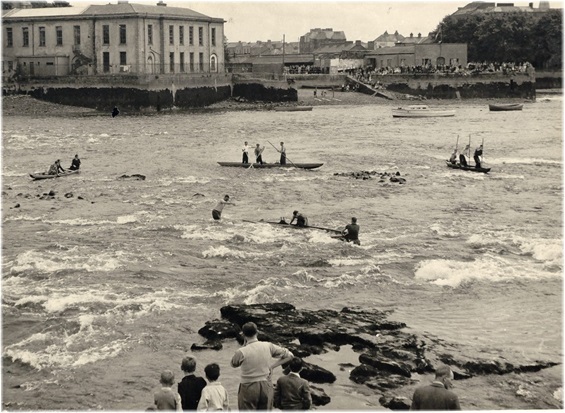 The race was followed by a hugh crowd from start to finish, but the real excitement started when the crews attempted to pole up the Curraghgower falls at low tide. it seemed impossible, each crew in turn tried and it was apparent that the long race round the parish had taken a lot out of them. The public certainly enjoyed the fun as boats were overturned and swept back time and again. Cameras were busy and supporters were up to their knees in water to urge their sides. 1951 - CORBALLY - William Lysaght, Seanie Gilligan, Larry Kinsella. 1954 - CORBALLY - William Lysaght, Dom Sheehan, Bob Kinsella. 1977 - ABBEY - Anthony McNamara, Jimmy McManus, P. McNamara. 1978 - PLASSEY - D. Gallagher, S. Hartigan, J. Sheehan. 1979 - PLASSEY - K. Hannon, P. Clifford, S. Sheehan. 1980 - PLASSEY - Mick Lowe, Kevin Hannon, Joe Sheehan. 1981 - PLASSEY - Mick Lowe, Kevin Hannon, Joe Sheehan. 1982 - PLASSEY - R. Clifford, Kevin Hannon, Joe Sheehan. 1983 - PLASSEY - Pat Lysaght, Kevin Hannon, Joe Sheehan. 1984 - PLASSEY - Pat Lysaght, Kevin Hannon, Joe Sheehan. 1986 - PLASSEY - Pat Lysaght, Kevin Hannon, Joe Sheehan.